Middletown’s Sweet Berry Farm spans 100 acres. The centerpiece: a farm market and cafe that sells its own seasonal fruits, veggies, cut flowers, premium ice cream, and a selection of gourmet and specialty foods. Though named for its strawberries, raspberries, blackberries and blueberries, the farm offers a broader selection of pick-your-own items, including apples, peaches and pumpkins. Quonset View Farm overlooks the shoreline of Aquidneck Island and covers 140 acres in Portsmouth. Pumpkins can be picked during weekends in October. The farm also grows and sells rhubarb, and is known for its potato production. Currently, Quonset View Farm is one of only a few potato farms left on Aquidneck Island. Note: this is a cash-only facility. Frerichs Farm in Warren hosts a giant pumpkin weigh-off on October 7, a pumpkin palooza (which includes a pumpkin coach and a Western Town) every weekend through the end of October, a pumpkin drop (where a giant donated pumpkin is hauled up and dropped for a spectacular explosion) and more family activities throughout the season. The gift shop, housed in a barn, offers custom-made pieces, gifts and ornaments. 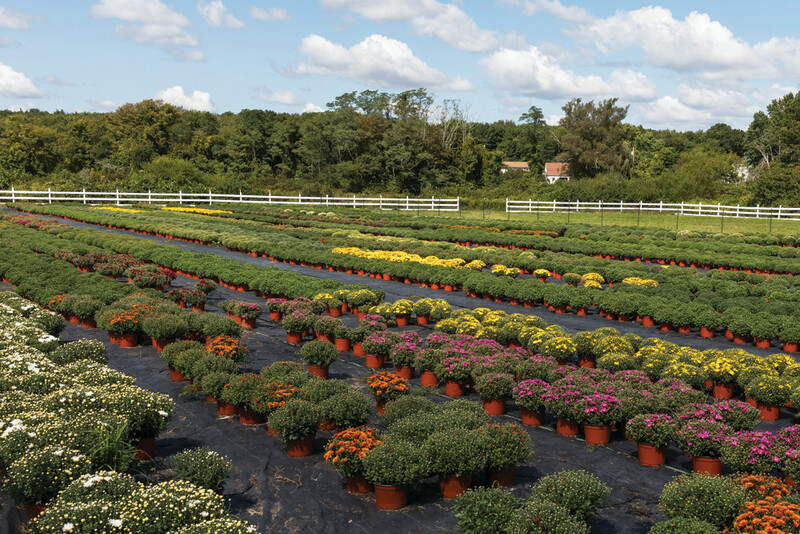 The farm has 11 greenhouses, roughly 20,000 mums, and a variety of annuals, perennials, herbs, vegetables and more. Coggeshall Farm Museum, located on 48 acres in Bristol, is a living museum that depicts what life was like on an eighteenth-century farm. Interpreters, donning the clothing of that time period, perform daily tasks – from milking cows to making candles – and guests can choose to get involved. The property is home to livestock and fowl, an heirloom kitchen that features more than 60 varieties of vegetables, fruits and herbs, and more. For those interested in learning sustainable methods firsthand, check out the museum’s calendar for workshops. Two words: goat yoga. That’s right, Simmons Organic Farm, sitting on 120 acres in Middletown, was the first in the state to offer this new yoga trend, which is exactly what it sounds like: an outdoor yoga class in which participants are surrounded by baby goats. The farm, which specializes in growing traditional and heirloom produce, is also known for its farm stand, a community-supported agriculture program (CSA) and a petting zoo, offering visitors a chance to get up close with goats, lambs, a pony and more. Simmons Farm offers fresh eggs, grass-fed beef, pork and its own cheeses, made fresh daily using the farm’s own goat and cow milk. Operated by the Mount Hope Trust, Mount Hope Farm is a national historic site housed on 127 acres of land in Bristol that includes a year-round farmers market, an award-winning 12-room bed and breakfast, a Civil War–era barn you can rent for weddings and other functions, a resident 4H program and a kids’ summer camp. Also on the property are hiking trails, an education center and farm animals (sheep, chickens, goats, donkeys, oh my!). Its produce – roughly 1,600 pounds all together – is donated to a food bank. Here’s to the locavores: “I think that as the farm-to-table movement continues to escalate, people are appreciating more and more the value of buying and eating something that’s grown as close to home as possible. Four Town Farm in Seekonk has been around for five generations and offers locals fresh produce for seven months of the year. Its farm stand sells flowers, fruits and vegetables. With more than 30 crops grown on-site throughout the year, Four Town Farm is best known for its asparagus, melons, sweet corn and strawberries. The farm offers pick-your-own strawberries, raspberries, peas, flowers and pumpkins. There’s art in everything. But have you ever been introduced to the art that is corn maze landscaping? Escobar Farm in Portsmouth features an eight-acre corn maze, which has, over the years, been sculpted into the Providence Bruins logo, farm animals and more. Visitors can also stay at the property’s Farmhouse Inn, take a hayride and visit the pumpkin patch. And at the root of the operation is a dairy farm: Escobar’s Highland Farm. 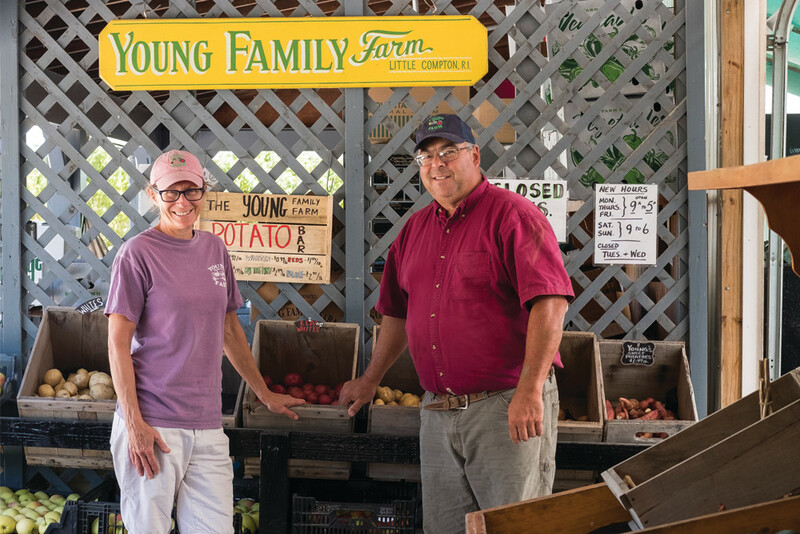 Young Family Farm was established 20 years ago in Little Compton. There, you’ll find a family-run farm stand with fresh farm crops, homemade pies and pizzas with fresh vegetables from the farm, an apple orchard (mark your calendars for its Columbus Day weekend Apple Festival), and pick-your-own options, including apples, pumpkins, flowers, sugar snap peas, lettuce, spinach, kale, and red and golden beets. Young Family Farm also operates a small wholesale potato business. Spanning 300 acres, the farm is one of the three largest in the state, with 100 acres devoted solely to potato production.